This is what happened to my couch when I left my Springer Spaniel, Oreo home with my husband for a few days while I went away on a business trip. Needless to say, the couch got trashed! Oreo in his crate the very next day, after he destroyed our furniture; he obviously still had some issues as the bed that was once in there got shredded!! Talk about issues!!! So, we got Sophie (liver and white) with the hopes that the couch incident wouldn't be repeated, now they're always in the tub together...not sure why, but if you can't find them and hear thumping, check behind the shower curtain and you'll find them!! 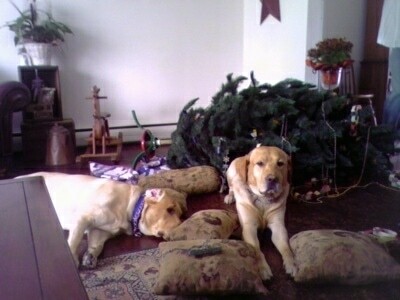 "After a play romp around the living room Wilbur and Parker, two Yellow Labs left the Christmas tree in pieces all over the floor. It was a week before Christmas and I guess they just got too excited thinking about Santa Paws..."
I kept my Golden Retriever, Lucky confined to the basement while I was at work. Apparently that was not okay with him, as he broke the door down to get out! This is him admiring his handiwork! Here is a close-up of the door; he scratched a hole to get out and ripped down the door frame. And you would never think he was capable by looking at him! I guess he just wanted his Mommy REALLY badly and you know how strong love can be ;-) We got him a “brother” to keep him company during the day (he’s in the background of the above pic) and we’ve had no house damage ever since. Raisa the 1-year-old, female, red-and-white Siberian Husky. She lives in the south of Brazil.